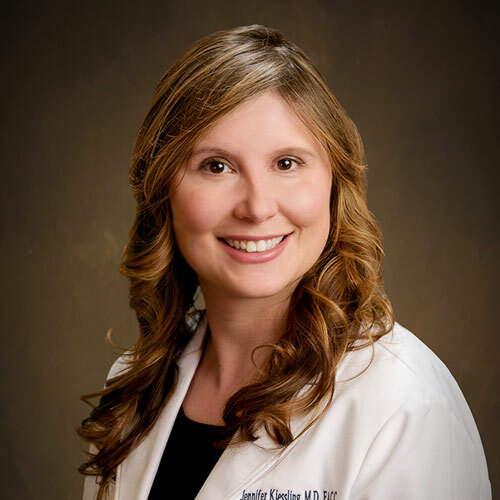 Dr. Jennifer Kiessling is a native of Huntsville. She received a Bachelors of Science in Electrical Engineering from the University of Alabama at Birmingham in 2001. She then went on to graduate from the University of Alabama School of Medicine in 2005. During her time in medical school, Jennifer was actively involved in medical research with the departments of neuroscience as well as surgery. After graduation from medical school, she completed a surgical internship at the Baptist Health System in Birmingham, AL. She then completed her internal medicine residency at Baptist Health System. It was during her time in internal medicine residency that she decided that she would pursue cardiology, and she returned to UAB Hospital to complete her cardiology fellowship. Dr. Kiessling also completed an Advanced Heart Failure/Heart Transplantation Fellowship at UAB. She is board certified in Internal Medicine, Cardiovascular Disease and Nuclear Cardiology. She is a Fellow of the American College of Cardiology. During her cardiology fellowship she was continued to be involved with the education of medical students. She served as a preceptor for UAB first year medical students. Dr. Kiessling continues to serve as a mentor for medical students as well as students invested in the field of medicine. Upon graduation from the cardiology fellowship, Jennifer knew that she wanted to return home to practice cardiology in her hometown. In her spare time, she enjoys running, cooking, gardening, and walking her two shelties, Harry and George. Dr. Kiessling’s goal is to improve the heart of patients by offering evidence based, personalized, and comprehensive care. We are so very happy and excited to have Dr. Kiessling in our office. She is accepting new patients. Please call today for an appointment.